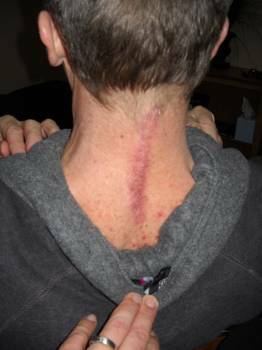 This is Dave Haarstad's neck, and his story is a good one, lots of lessons to learn. About four years ago Dave was in a car accident while he was working. Clearly the fault of the other driver. Initially, he was cared for by the medical and physical therapy communities, and even found relief with chiropractor, initially. Fast forward through 2-3 years of pain, suffering and fighting with the insurance company to continue his care. In 2010, Dave and I (Dr. Anderson) met at one of our chiropractic community service booths. It had been years since he had had care for his injuries and he was continuing to get worse. He was at wits end because he knew that he needed something. During the first couple months of his care, Dave's greatest hope was when it felt like his lower back stopped getting worse. (If your child is in a wagon rolling down a hill, you need to stop the momentum downhill before you can pull them back to saftey at the top of the hill). He was encouraged, as was I. About that time, the insurance stepped in again. This time they said that they had approved a surgical fusion of his lower neck to alieviate the pressure on the nerves that were causing so much disfunction that he was in constant pain with symptoms into his shoulders, arms and hands. Dave knew that this would be the last chance that the insurance, that is in place to help injured workers, would approve of this option. So, he decided to go through with the surgery. This is the portion or the story that is inspiring. Eleven days after his surgical fusion, he was back in the office for his adjustments. As his neck heals from the surgery, we will let it be for a while, that doesn't mean that there aren't many other areas of his spine that we can work on. Dave said himself, of his quick return, "I don't want to give any other area of my back the chance to get bad enough to go through this again." Many people believe that chiropractic is no longer an option after surgery, that is not the case. In many cases, it is more important to take care of the rest of the spine after one portion has been surgically altered. Many people also believe that chiropractic care should be limited to a few visits, even in cases as extreme as Dave's. Dave Haarstad, I acknowledge you for knowing that your healing will take time and that while we take pressure off of your nerves, you are the one doing that healing. After any significant accident, consistent, continued care is huge. Chiropractic is the most specialized type of care to use long term. Sometimes sugery is necessary, and in most cases, chiropractic can still help keep the damage from spreading. No matter how bad you've gotten, chiropractic can help, if you are willing to be a patient, patient.